I was first introduced to the paintings of Morris Graves 30-some years ago in a college Art History class. 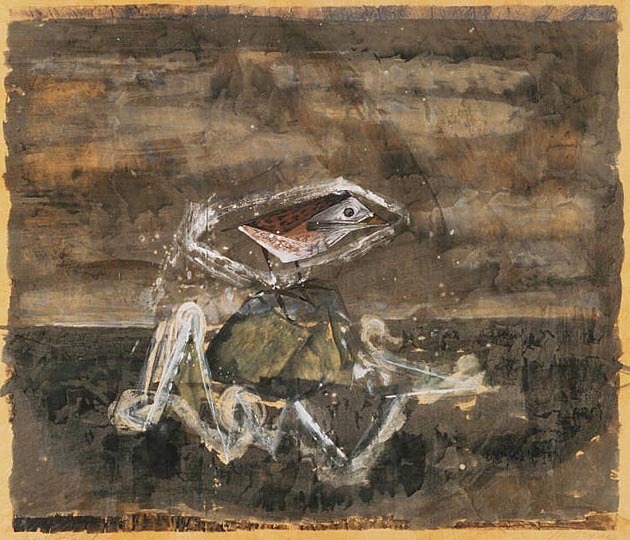 The painting above is titled “Bird Depressed by the Length of the Winter of 1944.” (It is not a good image–sorry. 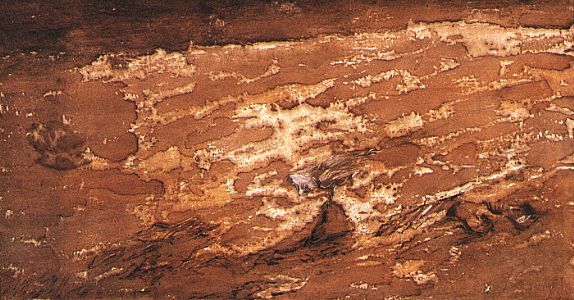 That is a bird there in the center of the painting, and he does look pretty down.) Talk about the power of a good title. At first I laughed, then I wondered what it meant and then I knew I wanted to see more of Morris Graves’ birds. In so many ways I think of Graves as the quintessential Northwest painter and perhaps I identify because of that. His work seems to capture, for me, a melancholy and darkness that lurks in the weather and forests of the Northwest. I have been thinking about him lately because I have been thinking about the differences between representational art and abstract art. While Graves work is “representational” it is far from “realistic”. I am often frustrated, especially in the quiltart world that realism is so highly prized in representational art and it seems the more lifelike and photograph-like the work, the more awe it inspires. I love that Graves’ birds do not look like real birds, that they stand in for feelings and moods and probably represent his alter ego. See what you make of them. Here are some samples. If you are not familiar with Morris Graves, there is a lot available to see on the web and, of course, he painted other subjects besides birds. I recommend his work. It never fails to engage me both visually and intellectually. Here is his painting entitled “Oregon”. I am an artist and I am wanting to sculpture two large Ravens… on drift wood, almost life size and I am looking for others that like birds, has Morris Graves ever done Ravins ?? Graves is wonderful. I had seen his work years ago and forgotten about it. What a poetic image he has made of his birds. They are only a little bit abstract, but so expressive! Thank you, Terry. It’s interesting to see hints of modern art movements filtered through Graves’ fingers and mind. 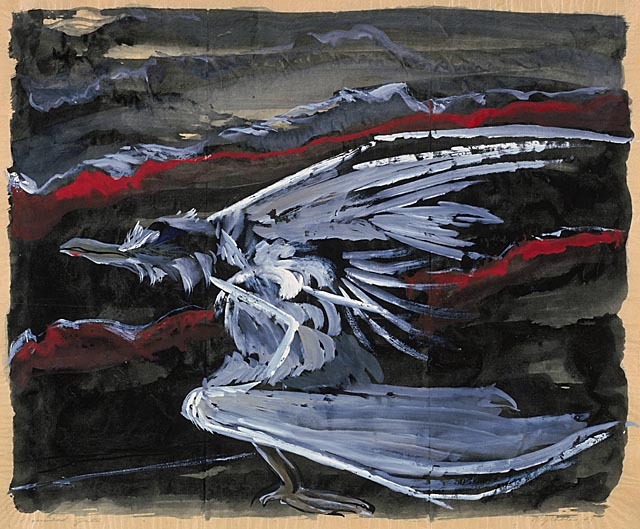 In the piece that Olga mentions, Bird Singing in the Moonlight, I see cubistic elements, and the last bird Terry has here, the crow-like image, uses paint like de Kooning. 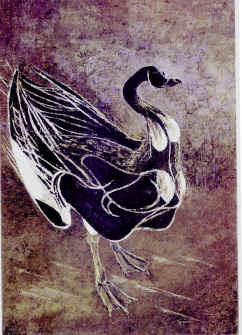 One of these images looks like a woodblock print, incredibly different from the crow-ish creature below. 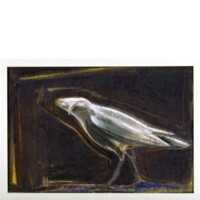 Graves’ captures the various different birds exceedingly well, even while distorting them to suit his meaning. Cubism is a bit earlier than Graves, of course, but de Kooning would have been a contemporary. Taking a single motif, like birds, and using them in many different ways to communicate deeply emotional or intellectual attitude works well. There’s enough of a hook to capture us and enough meaning to maintain our interest. It’s useful to have a number of these motifs in front of us, to see how he works his ideas through. Terry, I often feel like Graves’ view is definitively Pacific Northwest, where the change of season from winter through spring is often drawn-out and dark and yet has an enormous life-force pushing through the gloom. It’s odd then, that his “Oregon” is so flimsy, so wispy. 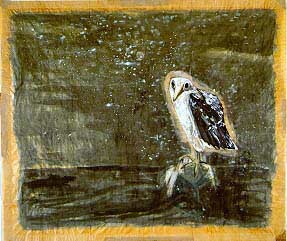 The first painting, “Bird Depressed, etc, etc.” is the one at the PAM. Eileen, I agree that the Oregon piece does not have all the power and atmosphere of the bird pieces. I am traveling at the moment and was in the Boise Art Museum several days ago, where they had a small exhibit of Morris Graves’ flowers. They, interestingly, reminded me of the birds–mostly white or pale yellow flowers emerging eerily out of murky, dark backgrounds. Made me think of the triumph of life emerging from the grimmest of circumstance. It is definitely Graves “dark side” that attracts me. Interesting paintings, and a good model of the type of art I should be striving towards. 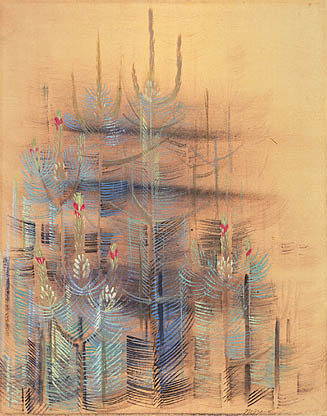 I liked his birds that are in some sort of place, more than the ones that seem like a portrait of a single bird. the “oregon” piece, in contrast, did not speak to me. even though it has nice warm colors and a clear composition, the birds and their personalities and stories seem more worthy of observation and analysis. Which Graves painting is at PAM?